Tap the button on the Toolbar to display Main menu. You can select Library or Recent mode in the Main menu. 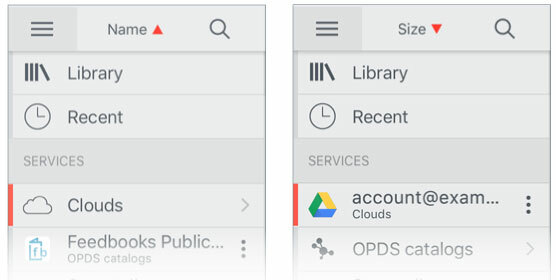 And also go to various services (Clouds, OPDS catalogs, Photo library on your device, Document picker, WiFi Connect). 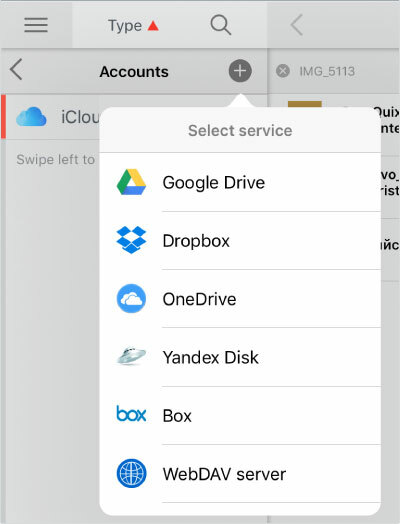 Main menu also includes app Settings and Support button, Transfer list (for Clouds and OPDS catalogs). Tap the Clouds or to editing. Tap to add Service. Choose service in a popup window.